On 5 February the work on the cast steel stretchers was inspected by John Graham for Wayne Jones and Partners who are our Vehicle Acceptance Body. The stretchers passed the inspection and John has signed the documentation. 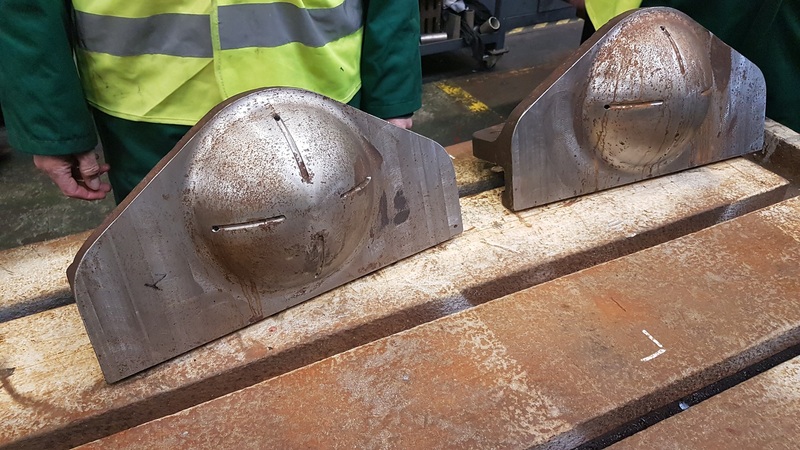 You can see that CTL Seal have been welding more plates into the bedplate so that all components can be accurately aligned. here's a brand new, shiny bogie centre pivot sitting on the inspection bench in CTL Seal. The pivot is fastened to the bogie stretcher, fixed between the main frames and pointing downwards. This engages with the centre slide on the bogie. 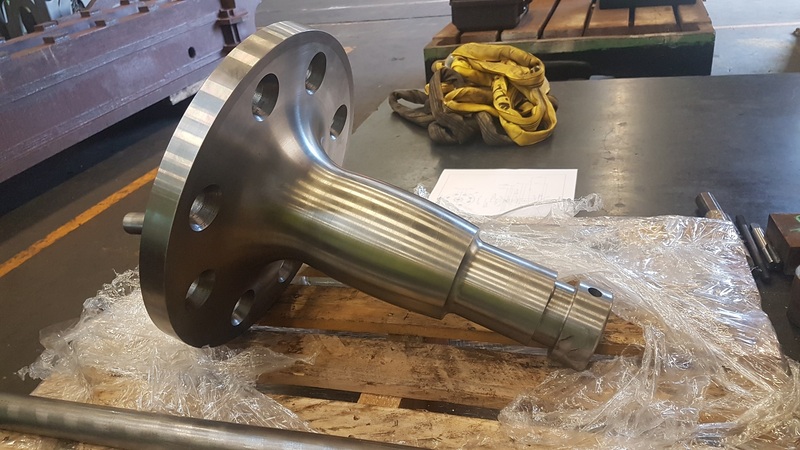 You can see that the main bearing surface has a shallow radius. This allows the bogie to rock slightly as it negotiates the track. The cast stretchers have had to be returned to the machine shop. We've found that the metric equivalent of the 1-1/4" thick main frame plates is slightly oversize. A shallow groove in the stretchers needs to be eased out to allow the main frames to sit correctly on the stretchers. We're hoping that machining will be finished towards the end of the week. 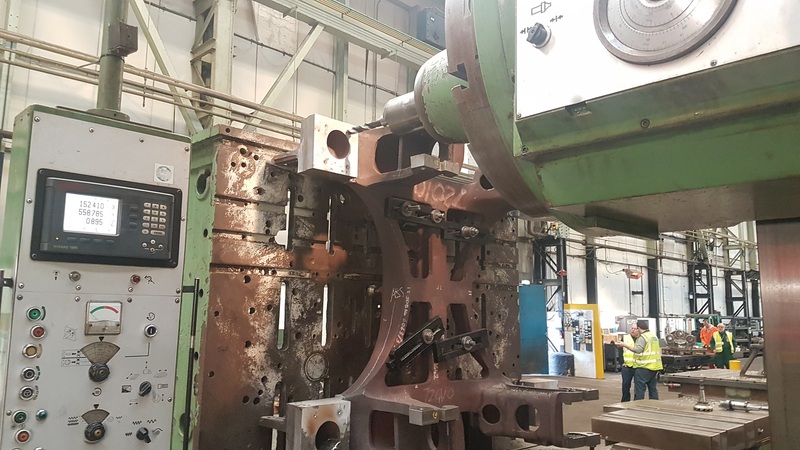 This was the final step in the machining of the middle cast steel stretcher. 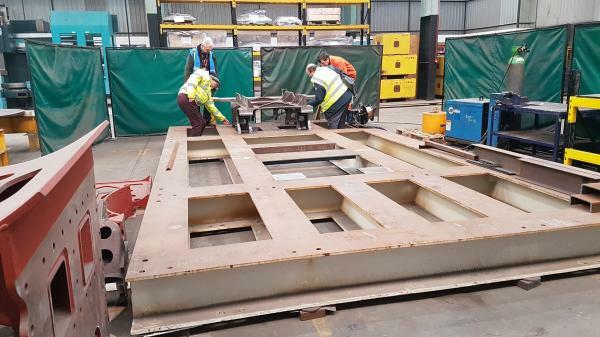 Not long after this photo was taken, the stretcher was lifted off the machine, ready to go to the assembly area. 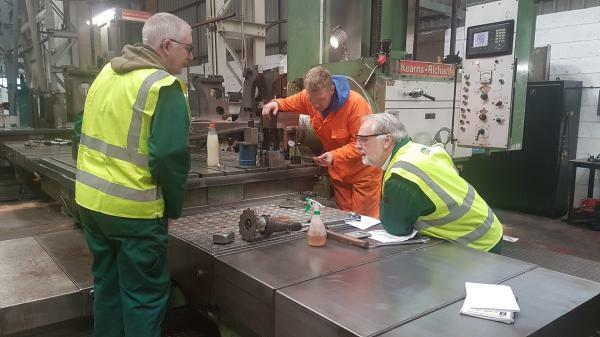 Here Keith and Alan from the SSLC engineering team discuss with CTL Seal "spot facing" of the stretcher. Spot facing ensures that the fasteners (here a nut and washer) sit on a flat surface rather than the rough metal of the casting. 4 spot faced bolt holes can be seen below the machinist's right hand.